The 2015 results of the Universe Fraze Mowing process were superb. 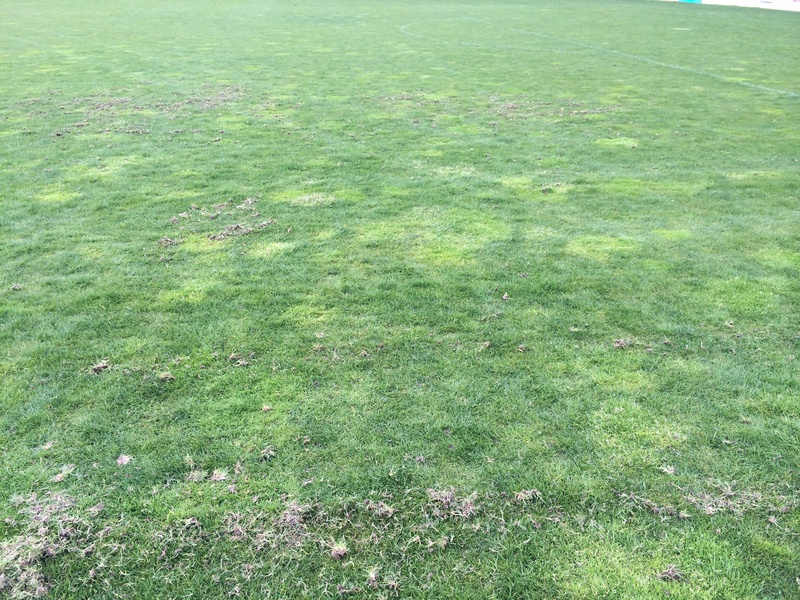 Poa Annua plants and seed have been removed, along with 2014’s thatch and organic build up to keep the field surface from becoming slick. Now new ryegrass and Kentucky bluegrass seed will be sewed. But even more importantly for durability and increased field use, the improved turfgrass varieties of RPR Ryegrass and HGT Kentucky bluegrass seeded last year following the Universe Fraze Mow can re-generate. This will encourage the grasses to spread, ultimately increasing the tensile strength of the base surface to reduce divoting and wear. 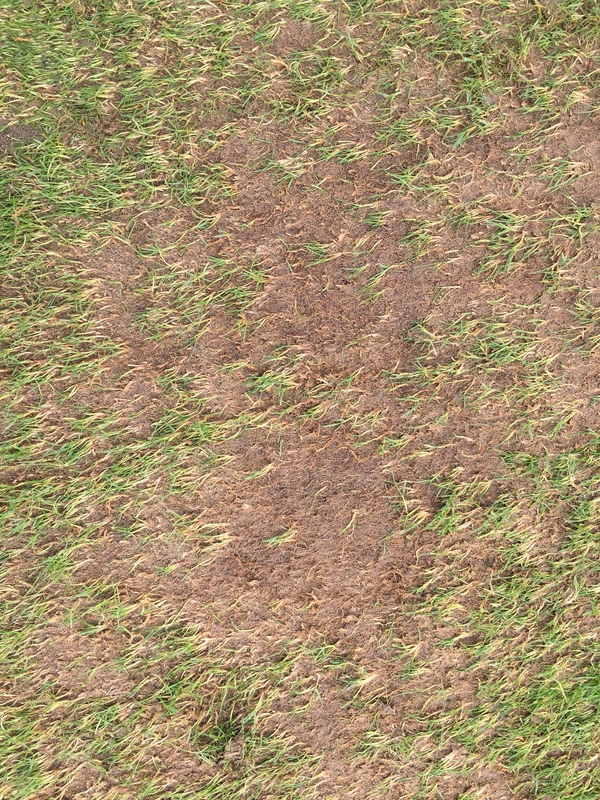 2014 reduced the poa annua population from 70% to 20%. The 1″ thatch layer was also removed along with the top of a thick organic layer. The removal yielded a dramatically better playing surface. The clean and re-generated surface is tight and strong, leading to nearly no divoting even when being used in the rain. 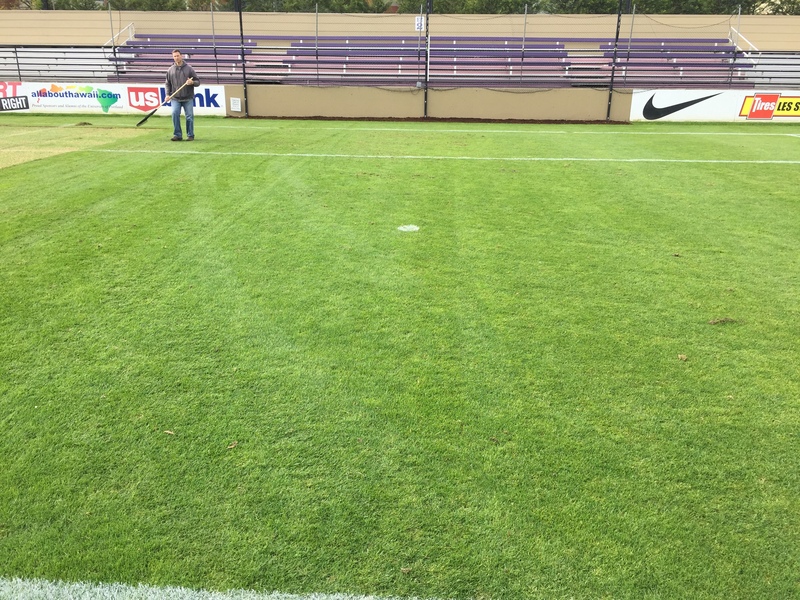 After 3 months of camps in Summer of 2014, a full men’s and women’s college schedule in the fall, and 13 spring matches, the field was nearly perfect when the 2015 Universe Fraze Mowing took place. 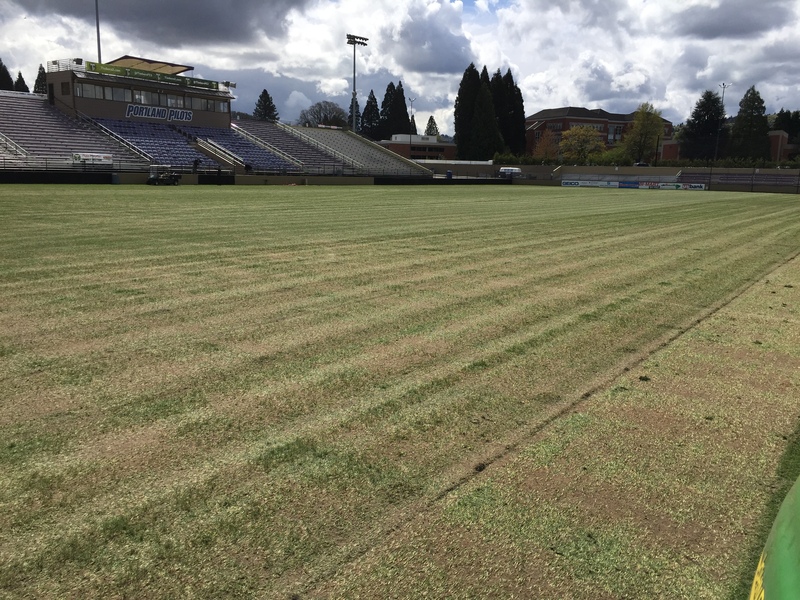 When Merlo Field is/ was in such excellent condition and the poa annua had been dramatically reduced, why Universe Fraze Mowing in 2015? From Field Manager Jordon Montgomery… “We want to continue to improve the playing surface while increasing use. 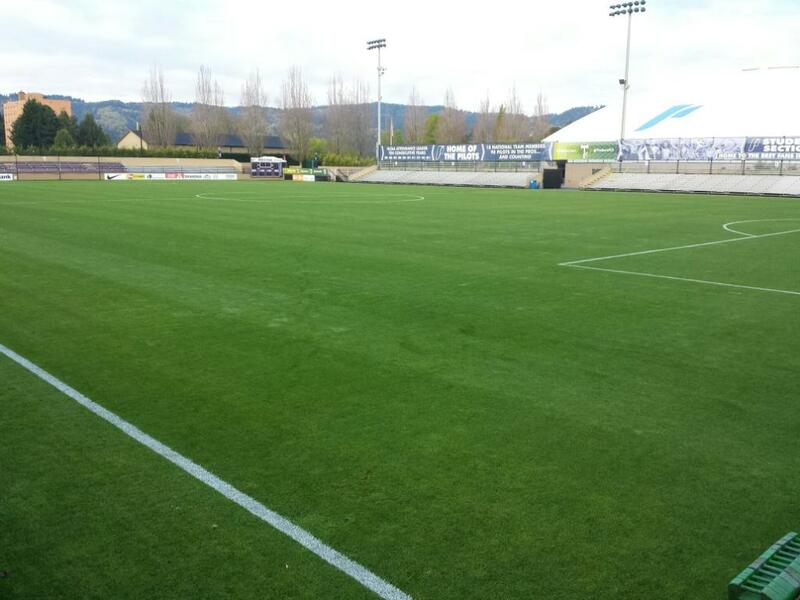 The introduction Portland Timbers 2, the USL pro team calling Merlo Field home is an example of that. All our home teams and events need the best playing surface we can provide while being environmentally and budget conscious. That all leads to Universe Fraze Mowing”. AMAZING EVOLUTION & Quick History! 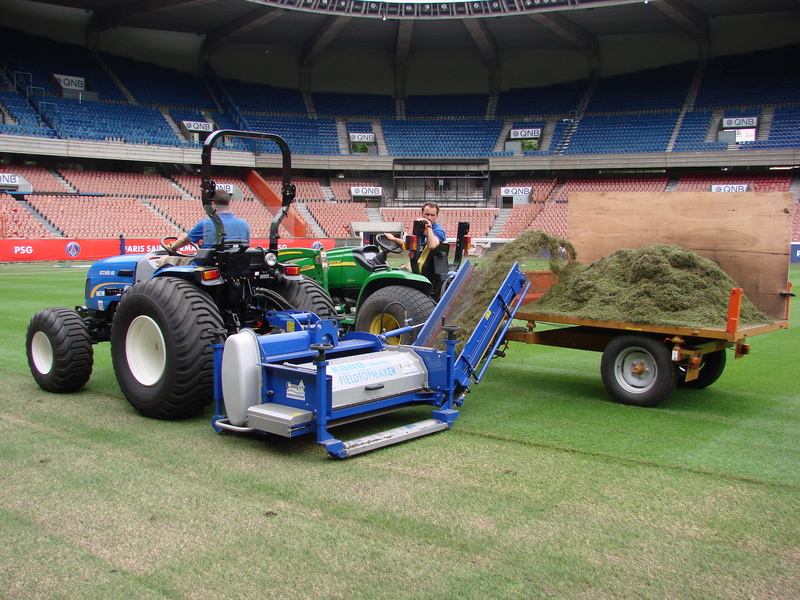 Universe fraze mowing cool season turfgrass was first performed at Paris St-Germain’s Parc des Princes Stadium in July of 2013. 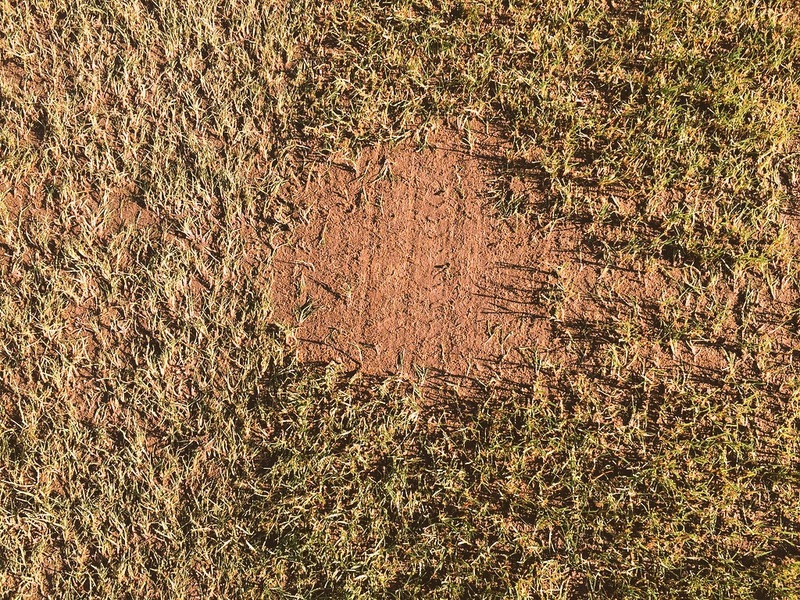 New Head Groundsman Jonathan Calderwood chose the bold method, previously only used in the United States on bermudagrass, to remove the poa annua plants in his pitch and leave behind the existing desirable Kentucky bluegrass and Ryegrass. So yes… Universe Fraze Mowing is DIFFERENT than basic fraise mowing. Fraise mowing was introduced in 1996 by Mr. Ko Rodenburg, Superintendent of Parks Maintenance in Rotterdam, Holland when he invited the KORO Field Topmaker. Rodenburg invented the machine to clean the poa annua seed off the top of his playing fields and to encourage some basic regeneration. Fraise mowing was born! With the introduction of the KORO Universe® Rotor for the Field Topmaker in winter of 2012-2013; allowing stolons and rhizomes on spreading grasses to remain while removing organic, thatch, and weed seed; lead to Universe Fraze Mowing directly from this blog to Mr. Allen Reed and Mr. Miles Studhalter’s bermuda fields at FC Dallas. 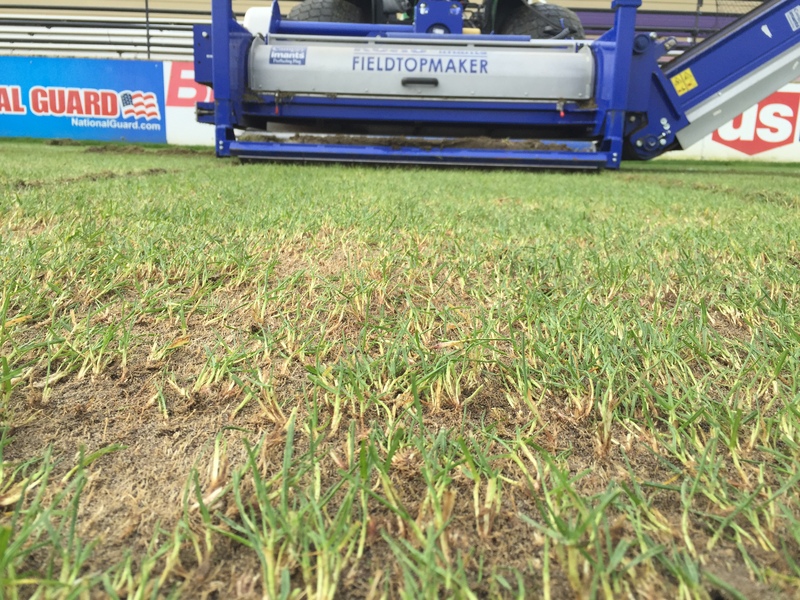 See for details: Summary of a new concept; Fraze Mowing & Concept to Active Practice; Fraze Mowing Debuts at FC Dallas. The use on bermudagrass had started, then Mr. Calderwood working with Mr. Simon Gumbrill from Campey Turf Care, took the lessons from bermudagrass and implemented them to cool season. Now Jordon Montgomery in Portland as taken it even further with repeated use. AMAZING how it continues to evolve with creative minded Field Managers ready and willing to try to new things! #GrassCanTakeMore! This entry was posted in and Durable Plant Under High Traffic, Field Improvement Ideas, Healthy, Information Reads, Maintaining a Strong, Healthy, and Durable Plant Under High Traffic, Turfgrass Growth and tagged fraze mow, INNOVATION, Natural Grass, poa annua control, TURFGRASS by GrowingGreenGrass. Bookmark the permalink.